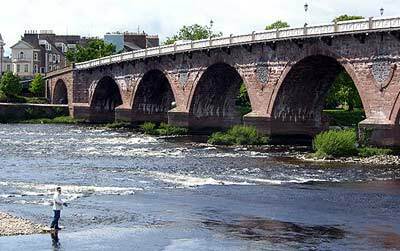 Stay in an executive style award winning Apartment development in Perth with wonderful views across the River Tay towards the Old Perth Bridge and Grampian Hills beyond. The Holiday Apartment occupies a splendid position in one of Perth's most sought after city centre areas with all local amenities and leisure attractions within walking distance away. Internally the property is tastefully decorated and offers bright airy spacious accommodation throughout. The Commercial Street Development overlooking the Tay is encompassed by landscaped gardens with car parking. 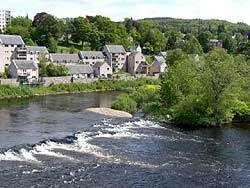 The development is linked to the famous Norrie Miller Walk riverside walk and gardens. There is a good sized double bedroom, and en-suite shower-room, over-looking the river with built in wardrobes and storage cupboards. Whether a city-break, business trip, short break or golfing expedition, Tay Chambers self catering Apartment, Perth, Scotland is the perfect location. "I just wanted to say what a lovely stay we had last week at your new apartment. Eveything was absolutely lovely and the views looking on to the river Tay were just beautiful. You did a really good job getting everything ready in such short time.I hope to be in touch in the future to arrange another visit."